Some crops don’t grow as well in the blazing sun. High temperatures in a greenhouse can even be disastrous. 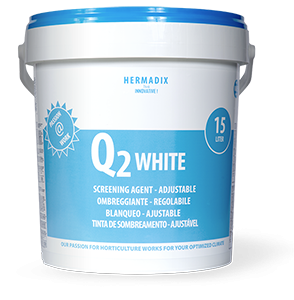 Shading agent is the solution here: it’s easy to add a chalk layer that reflects light and reduces heat to your greenhouse in the summer period. 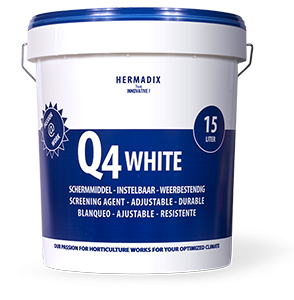 Hermadix has the right shading agent for every crop and every greenhouse. In the Netherlands, our products are available from Royal Brinkman and various specialist horticultural contractors. Q Black: a solar eclipse in a bucket, to achieve maximum screening. 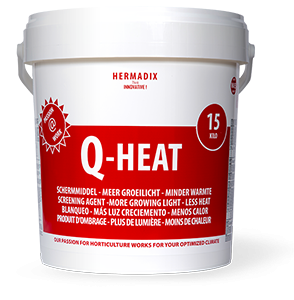 Q Heat is a shading agent that only reflects heat radiation. Resulting in a cooler greenhouse climate, whilst letting the growing light through. A liquid, weather-resistant screen product that reduces the amount of sunlight entering a greenhouse in the summer months. A shading agent that offers medium weather resistance and a flexible screen percentage. It has been developed specially for glass, film, polycarbonate and acrylate. 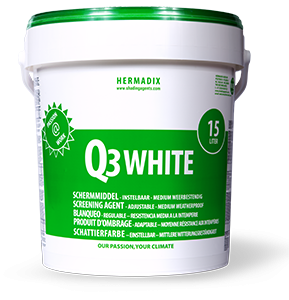 This liquid shading agent protects your crop from bright sunlight and high temperatures in the summer period.